Reduced price - was 128.00 EUR. 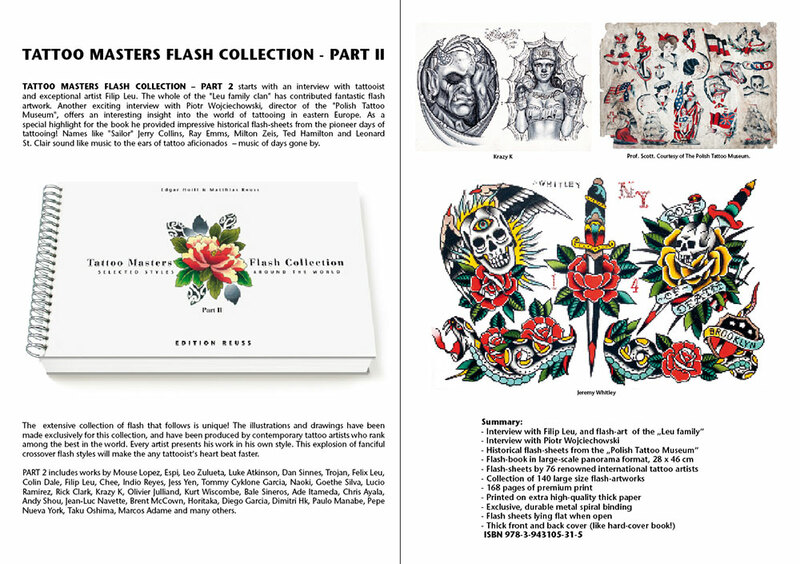 Enjoy two thrilling tattoo-flash books! These two tomes rank among the best and most extravagant flash–books that have ever been published. Edition Reuss, well-known and renowned for its collector’s items, once again comes up with astounding heavy coffee-table books that set standards. 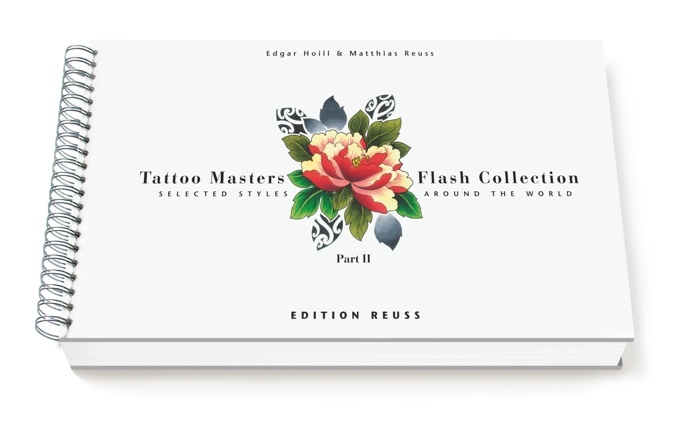 TATTOO MASTERS FLASH COLLECTION – Part 2 starts with an interview with tattooist and exceptional artist Filip Leu. The whole of the "Leu family clan" has contributed fantastic flash artwork. Another exciting interview with Piotr Wojciechowski, director of the "Polish Tattoo Museum", offers an interesting insight into the world of tattooing in eastern Europe. As a special highlight for the book he provided impressive historical flash-sheets from the pioneer days of tattooing! Names like "Sailor" Jerry Collins, Ray Emms, Milton Zeis, Ted Hamilton and Leonard St. Clair sound like music to the ears of tattoo aficionados – music of days gone by. The extensive collection of flash that follows is unique! 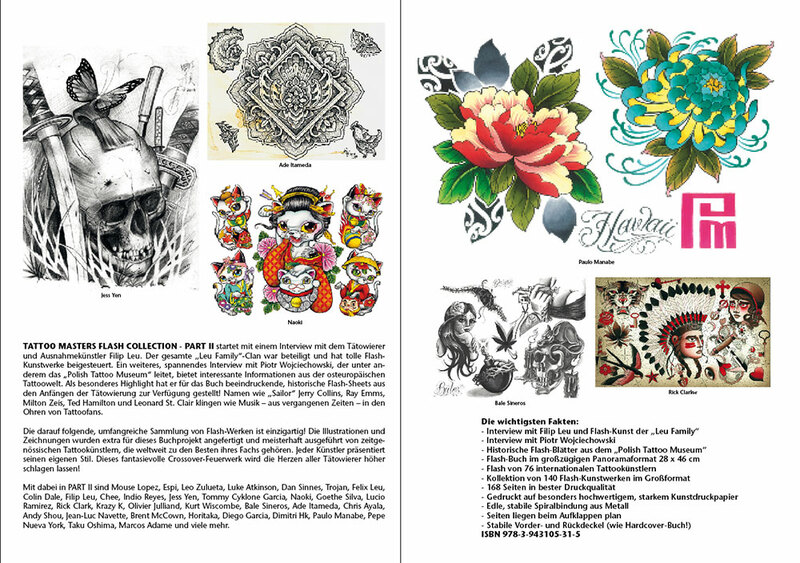 The illustrations and drawings have been made exclusively for this collection, and have been produced by contemporary tattoo artists who rank among the best in the world. Every artist presents his work in his own style. This explosion of fanciful crossover flash styles will make the any tattooist's heart beat faster. Part 2 includes works by Mouse Lopez, Espi, Leo Zulueta, Luke Atkinson, Dan Sinnes, Trojan, Felix Leu, Colin Dale, Filip Leu, Chee, Indio Reyes, Jess Yen, Tommy Cyklone Garcia, Naoki, Goethe Silva, Lucio Ramirez, Rick Clark, Krazy K, Olivier Julliand, Kurt Wiscombe, Bale Sineros, Ade Itameda, Chris Ayala, Andy Shou, Jean-Luc Navette, Brent McCown, Horitaka, Diego Garcia, Dimitri Hk, Paulo Manabe, Pepe Nueva York, Taku Oshima, Marcos Adame and many others. - Interview with Filip Leu, and flash-art of the "Leu family"
- Historical flash-sheets from the "Polish Tattoo Museum"